The Great Italians is the next concert at our newly renovated Croft Farm Arts Center (100 Bortons Mill Road) and will be held on Sunday May 4 at 3 p.m., during Art Blooms Week. The concert features Philadelphia Orchestra Cellist, Bob Cafaro, who will be performing selections from Puccini and more. Singers from the Ocean City Pops and Academy of Vocal Arts will be performing the music of Frank Sinatra, Dean Martin, Luciano Pavarotti, Mario Lanza and many more! This will be a wonderful concert, so buy your tickets today (the last concert was sold out). Call or visit the Department of Recreation for tickets. For information or to reserve tickets: 856-488-7868 or email Arts@CHTownship.com. For more information visit www.CherryHill-NJ.com [http://www.cherryhill-nj.com/] | unsubscribe [http://www.cherryhill-nj.com/list.asp?mode=del] from this mailing list. 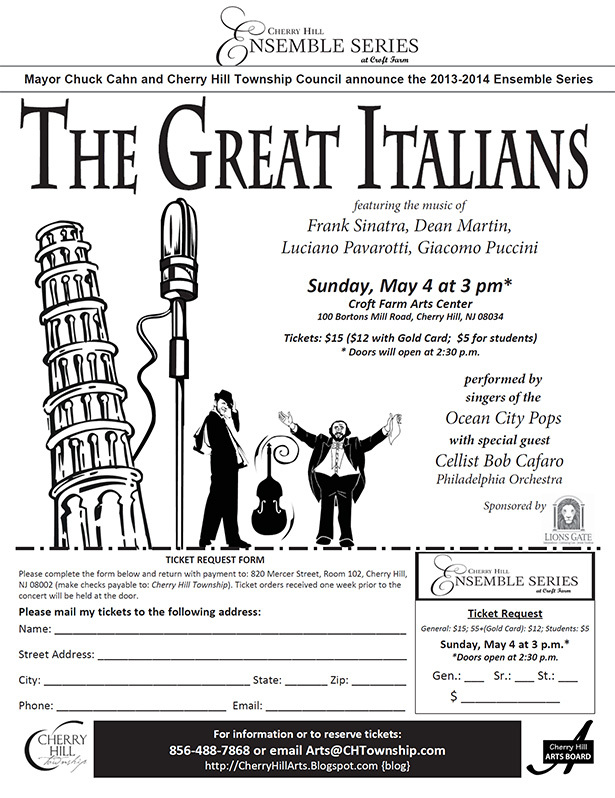 Ensemble Concert: The Great Italians - Croft Farm, Sun., May 4 at 3 pm. Tickets: $15, $12 or $5 for students. Call to reserve tix today: 856-488-7868.